I decided to treat you all to an extra post this week and so today we’re going back to basics with that classic dessert – Banoffi Pie. That’s just one of my little niggles regarding this dessert that have ultimately led to this post. Done properly, to the original recipe, it is a classic, sophisticated and delicious dessert, worthy of a dinner party. But it rarely IS done properly and, over the years, I’ve seen it churned out on television in worse and worse variations, until this past week when I saw an absolute shocker and so I was propelled into making this post just to set the record straight if nothing else. I’m convinced that the fatty, over-sweetened mess that Banoffi Pie has evolved into, puts off a lot of people, which is a shame. Hopefully, if they can be persuaded to try it as it was originally conceived, they might just become fans. I’ve mentioned in a previous post how Banoffi Pie came into being, and one of the co-creators has also published online the back-story as well as his original recipe. Even though I am a fan of the original recipe, I’m going to change it a little. I know, I know……I realise I’ve just spent three paragraphs banging on about people changing recipes, but in my head this is ALLOWED – because in the past I have actually eaten original recipe Banoffi Pie. Over the years I’ve developed a personal rule of first trying a recipe in it’s original form, out of respect to the original author. That done, you can tweak it how you like, but make it their way first. I’ve lost count of the times I’ve been pleasantly surprised with the results. Once you’ve tried the original recipe too, you can pop back and we’ll carry on. Pastry Base: Yes, contrary to popular belief, the original recipe called for a sweet, shortcrust pastry, which is actually ideal for this dessert. We’re going to draw a discrete veil over the crushed biscuit-and-butter and (my personal bête-noir) chocolate-biscuit-and-melted-chocolate bases, which push this dessert into being sickly. The filling is so rich and sweet, having the dry, crumbly pastry is a perfect foil. I actually have a copy of the original recipe published in the second book of recipes from the restaurant where it originated ( “The Deeper Secrets of The Hungry Monk” ) which just specified ‘shortcrust pastry’. This I interpreted as carte blanche to use whatever recipe I liked. What I have for you here is the original sweet cornflour pastry which I adapted to a savoury version for the Cheese and Potato Pies. It has that extra crispness that a regular all-butter pastry lacks. Filling: I’ve seen some people get very precious about the caramel “I make it all by hand!” they cry, ladling in the butter and cream. However, these caramels tend to be rather runny, and to be blunt, the filling can be doing without all that fat. The original is much simpler and is obtained by simmering unopened tins of sweetened, condensed milk for an extended length of time. This can be done in a variety of ways, but my method of choice is in the slow cooker because you can leave it unattended, and it won’t boil dry. Cover the tins with water, set it on Low and leave it for 8 hours. You can simmer them longer, up to 12 hours, and the caramel will gradually become darker the longer it is left in the water. The caramel in the picture was taken out of the slow cooker after 8 hours. In the UK, the most well-known producer of milk products (Carnation) have recently started selling tins of caramel. These are great if you need a dessert at short notice, but I find the caramel isn’t quite as firm as when you make it yourself, as well as being, to my taste at least, a great deal sweeter. If convenience is what you’re after, I suggest simmering more than one tin at a time and keeping the home-made spares in the cupboard. 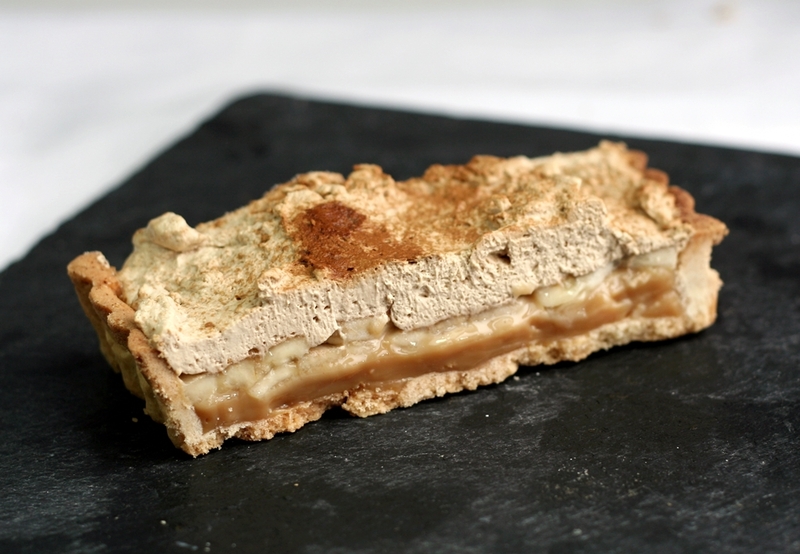 Banana: This addition/improvement transformed Blum’s Coffee Toffee Pie into Banoffi Pie. The banana is laid on top of the caramel and underneath the cream, NOT on the pastry base. This would make spreading the caramel very difficult, as the sliced banana would stick to the caramel and slide about. And no, they don’t go on top of the cream either, because they’ll just turn brown and become very off-putting. And if you DO put them on top of the cream and then throw chocolate on top to disguise the browning, you’re fooling no-one. One variation that meets with Ian Dowding’s approval is to replace the banana with a thickened apple puree, making an Appleoffi Pie. Made with sharp, cooking apples such as Bramleys, I can just imagine the delicious contrast in both flavour and texture, although I’d probably leave out the coffee from the whipped cream for this version. Coffee Cream: Yes, coffee cream – whipped cream flavoured with coffee. So often this is replaced with plain whipped cream, or even vanilla flavoured cream, to the dessert’s great detriment. And, contrary to Mr Dowding’s original, in my opinion the coffee cream should be unsweetened and strong to the point of bitterness. Using espresso coffee powder turns it into a fantastic counterpoint to all the sweetness in the caramel and bananas, as well as lifting the dessert into dinner-party status. Coffee can do that. It’s almost as if it’s status as a grown-up flavour, confers adult status on everything it touches. Chocolate for sprinkling/garnish: Whoa, whoa, whoa there, Nellie!? Whaddya doin’? You can’t go introducing a new flavour and shoving it on top of the pie just because you feel like it! Coffee, banana and caramel flavours are plenty busy enough, thankyousoverymuch! If you must sprinkle anything, a light dusting of espresso coffee powder is all the garnish it needs. Baking Tin: You can make this dessert in any size and shape tin you like. A 20cm round tin, preferably with a loose bottom to help ease out the cooked pastry case, is traditional, but this time I used my loose-bottom rectangular flan tin (13cm x 35cm), which means the finished dessert can be neatly cut straight across in elegant, finger slices and the different layers are clean and clearly visible. Put all the ingredients into the bowl of a food processor and blitz until the mixture resembles breadcrumbs. Knead smooth, then roll out thinly. Line your chosen tart tin, easing the pastry into the corners/sides. Leave the excess pastry overhanging the sides and chill in the fridge for 1 hour. Remove the tin from the fridge and, now that the pastry has relaxed, trim the excess from the sides. Prick the bottom of the tart tin with a fork. Line the tin with baking parchment and weigh it down with baking beads/rice. Bake for 12 minutes, then remove from the oven and take out the parchment and beans. If the edges are already brown, cover them closely with foil and return the tart to the oven until fully baked (10-15 minutes). Unless you’re making a huge (30cm+) tart, then one tin is all you’ll need. Warmed carefully, it’ll spread a long way and a 1-2cm layer is rich enough for a treat without becoming sickly. Open the cooled tin and tip into a small saucepan. Warm the caramel gently until it becomes smooth and pourable. Pour the warm caramel into the cooked pastry tart shell and spread it evenly over the base. Lightly grease some clingfilm with butter and lay it closely over the caramel. Whisk the cream and coffee powder together until firm peaks. Slice the bananas and lay a thin layer over the caramel. Cover the bananas with the coffee cream. I like to just spoon it over, and keep it light and billowy, but if you prefer something more formal, you can pipe it. What you must do, is ensure that all the banana slices are completely covered. Just like the meringue on a lemon meringue pie, make sure the cream goes right to the edge of the tart, touching the edge of the pastry. Any banana left uncovered with start to discolour very quickly, but covered with the cream they remain delicately pale. Dust the top lightly with espresso powder and chill until required. Thanks Mary-Anne for rescuing this recipe from the depths it has fallen into. I tried your recipe also using a rectangular tin and the pie was a winner.